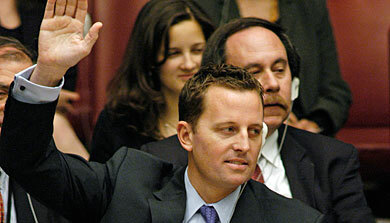 Richard Grenell was appointed spokesperson for the U.S. Ambassador to the United Nations by President Bush more than seven years ago and became the longest-serving public servant to hold that post. But when it came to having his partner of six years listed alongside the spouses of other U.N. diplomats, his dedication to the job didn't carry much weight with the State Department. Richard Grenell spent most of his days as spokesperson for the U.S. Ambassador to the United Nations putting out fires for the Bush Administration and battling to keep issues like human rights in Burma and Zimbabwe in the public spotlight. But after working for the U.S. Mission to the U.N. for more than seven years, his final media push was publicizing a more personal struggle that he fought internally with the State Department. Grenell, the longest-serving spokesperson for the U.S. Ambassador whose final day was Friday, September 26, started inquiring nearly four years ago about having his partner, Matt Lashey, listed in what’s known as the United Nations’ Blue Book, a reference guide of contact information for different member states of the United Nations as well as diplomatic personnel and their spouses. Initially, Grenell took a measured behind-the-scenes approach to the situation, but his appeals grew more pointed this past spring. “What put me over the edge was a friend and colleague who met her spouse after I was already with my partner -- they got married and subsequently were put into the Blue Book in a matter of days,” he says.